So, I’ll keep this simple, and trigger this flow on a new Account creation. You can actually change that, and use other conditions, like a record update. 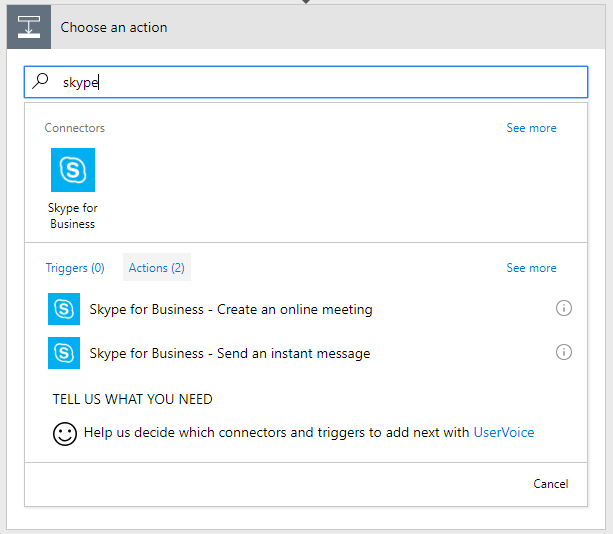 The example shows two actions, one is sending an email, the other is sending a Skype message. Ignore the email for now, you can do that the traditional way. First, I’m setting the trigger the flow. The condition is when a new Account is created. That’s easy as pie. Next step, I’m going to retrieve the Owner of the Account record. I need this in order to retrieve the email ID of the Skype message recipient. For this, I’m doing a Get Record step, retrieving the user with the identifier matching the Owner. You could do the notification to another user if you’re capturing a different field, but for the sake of simplicity I’m going to keep it at Owner. As I’ve said before, I’m going to ignore the Send Email step. You can play with that and see where it leads you. It’s pretty straight forward, trust me on that! 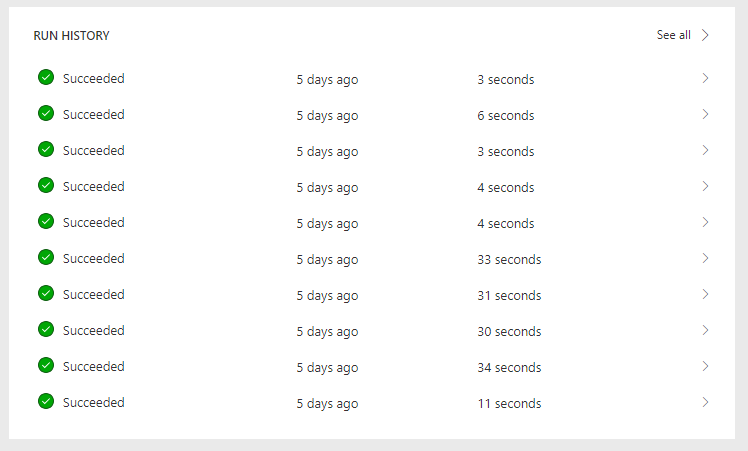 Finally, now that we have the recipient record, let’s add a new step for sending the Skype message. 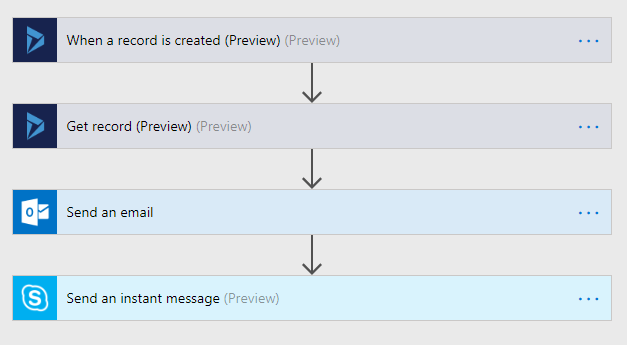 On the To field, select from Dynamics content the Primary Email field. Make sure that you pick the one in the Get Record (Preview) section in order to select the email for the Owner. Remember that Step 2, right? I’ve created a message body including other Dynamic content also. In this case I’ve added the Account Name. For that, you select the field from the When a record is created (Preview) step. That’s Step 1. Be careful not to mix these up, otherwise you will end up with unexpected results. And voila! Save and test your shiny new Flow. You should be seeing new Skype messages popping up now every time when a new Account is created with you as Owner. You can drill-down into every run, and see visually if a failure occurred and where. Very nice for tracking issues. You see here both runs and errors. Sweet. Now, while this is nice, I’ve seen some issues with regards to the timing. A Flow will retry when failed, and the plans describe the timing. But based on what I’m seeing and other comments I could find online, the reality is that there does not seem to be any certainty that the messages will be delivered in a reasonable amount of time. While running it in test, it all works snappy, but one enabled, I’ve seen delays of up to two hours before the message actually makes it to the user’s Skype. 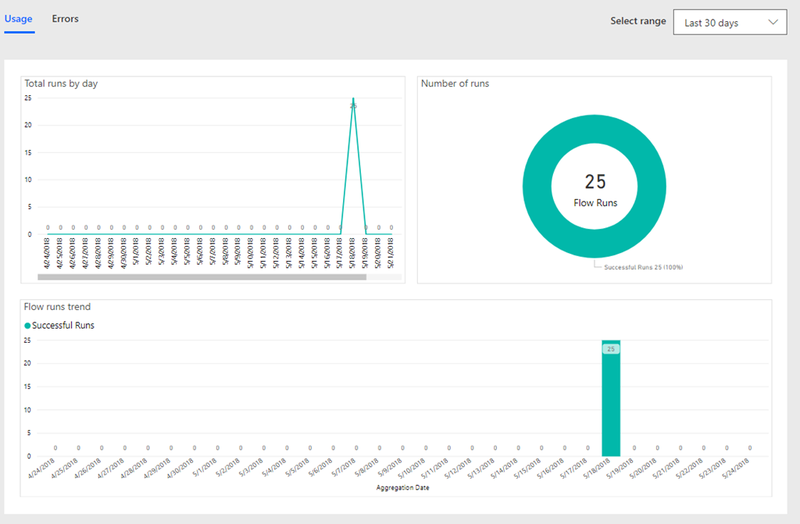 Others have been complaining in the Microsoft Flow Community Board of even longer wait times. I’m running under Flow Plan 2, I’m assuming the ones with longer delays are using probably the Free plan. Conclusion: It can be done, it’s easy and quite nice actually, but I would not use it for anything critical just yet. « When is a Two Options field Business Required?